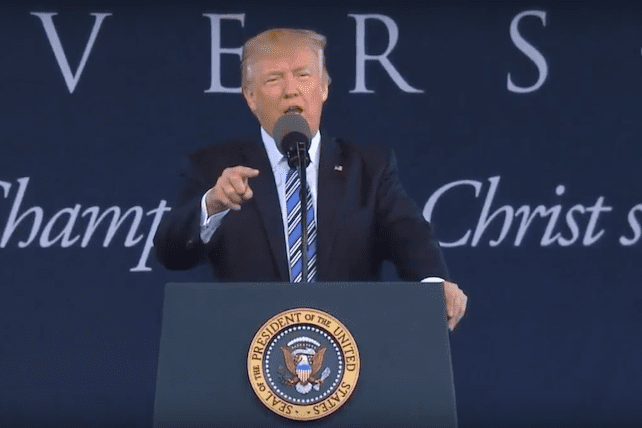 President Trump spoke at his first commencement speech this morning, May 13, 2017, at the Liberty University in Lynchburg, Virginia. Liberty’s President, Jerry Falwell, Jr., minced no words when endorsing Trump during his campaign, drawing criticism from Christians and non-Christians alike. However, now Falwell has a very influential friend in Trump, who recognized his surprising victory as only being attributable to “major help from God” and the votes of evangelicals. Repeatedly mentioning Falwell’s name in the speech, referring to their friendship and effectively patting him on the back for building such an impressive university after his father’s tradition with a rising football team to boot, Trump sounded exceptionally at ease and confident. Considering Liberty is the largest Christian University in the country, with an evangelical emphasis, Trump knew he was standing in front of a crowd, the overwhelming majority of which had recently voted for him.